When is a Birthday Cake not a Birthday Cake? …. When it is a bouquet! On a recent busy morning, my husband and I had received some bad news and had decided to go out for a quick lunch to get it off our minds for a while. However, we kept getting interrupted by phone calls and finally agreed not to pick up again. We were in the process of locking up the house when the phone rang once again. It was a familiar number so my husband reluctantly answered. Our son was calling with good news — he and our grandson were coming to visit the following week. Our spirits buoyed we began to lock up again just as I saw two dear friends headed up our front walkway. I puzzled over what they were up to until I saw they were carrying what appeared to be a rather large cake. With all that had gone on, I had completely forgotten my birthday was the following day. When they handed me the cake, I was surprised to find it was really heavy. 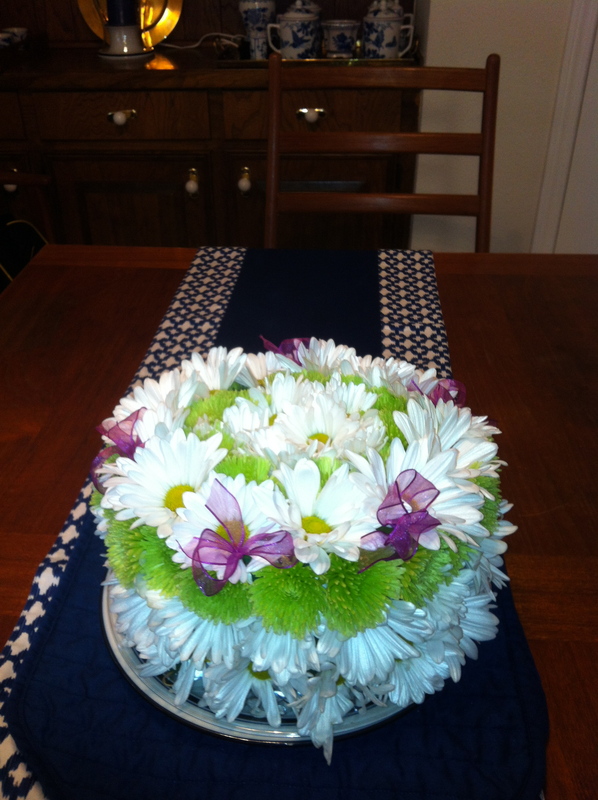 Turns out they had not baked me a cake after all, but as they carefully explained had arrange the dozens of daisies and pale green asters in cake-shaped floral foam. . A beautiful bouquet in the shape of a cake! I have seldom been so amazed or thrilled. As we finally headed out to lunch, I couldn’t help but reflect aloud on how quickly our spirits can hold both joy and sorrow at the same time and how things are often not what they seem – especially at first glance. The cake bouquet became a sacred object – it reminded me what a grace it is to be able to celebrate another birthday in such good health, the joys of long-term friendships and the blessings of both family and friends. The bouquet lasted for two weeks and I was able to share it with other friends who seemed equally amazed. It was a daily reminder to look more closely, to wonder what opportunities for wonder, gratitude and beauty are missed because I am trying to head out in another direction. As I pray an evening examen, I have a new viewpoint and a deeper way to focus as I look for God’s presence in my day. I have been re-picturing my day keeping in mind that because of low spirits or preconceived ideas I may have missed an encounter with joy, an encounter with God. I am determined to move a little more deliberately– to take a closer look, to listen more carefully – in the hope of being amazed by grace. This reflection is a mirror image of your whole personality and outlook – to me you have always been able to see the glass as half full instead of half empty – but your words are very touching and inspirational for me and a good reminder about looking about with the eyes of the heart. Bless you for sharing this with us.